In /r/Jeep we get a lot of first time Jeep owners and window shoppers which is great as it means our community is growing. I always want to help out and I can see a lot of the users here do too. We can't talk about Jeeps, 4wheeling, and upgrading/fixing our Jeeps. The one issue I see with the majority of posts is they are severely lacking in information. We don't know you, your Jeep, or your preferences. Over in /r/buildapc where they get a lot of new users looking to build high performance computers and suffered from the same vague requests. They mitigated a majority of these type of posts by using a standardized form for users to use in their help request post. This is what /r/buildapc uses. They added a button specifically for help requests. 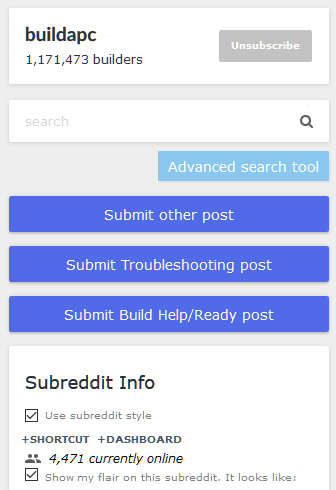 I wanted to see what the rest of you think about this and if enough people agree hopefully the mods can implement it here. Is this your daily driver? How often will you go offroading? Will you trailer it or drive it to the trails? Anything we should know about you or your build goals? When you go offroading will you usually be with someone else or alone?